I’m travelling across the western hemisphere, raising awareness of the troubling trends identified by Scientists’ Warning. So far, I’ve stopped in Washington, D.C. and Ottawa, Canada. 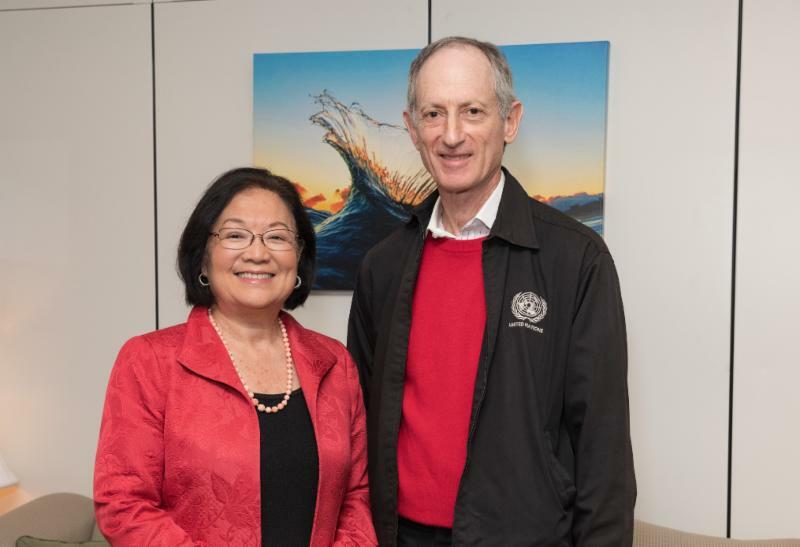 In Washington, D.C., I met with my legislator, Senator Mazie Hirono. I thanked Senator Hirono for urging the U.S. Department of Agriculture (USDA) to release federal funding to Hawaii farmers affected by natural disasters. I shared my concerns and presented the troubling trends identified by the Scientists Warning. We discussed the political realities both in general terms, and specifically under the extremely anti-environmental agenda of the current president and conservative Republican controlled Congress. One small victory was Senator Hirono securing federal funds of $4.1 million to the University of Hawaii to promote diversity and improve engagement in the science, technology, engineering, and math (STEM) fields. This will result in more scientists speaking truth to power. In Ottawa, Green Party Leader, Elizabeth May, and about 45 others attended my talk. With its urgent message and tone, my presentation was well received. A very thought-provoking Q&A session followed. Last March, Elizabeth May was arrested for protesting at the main gate to Kinder Morgan’s pipeline terminal. In court, Green Leader May pleaded guilty to a criminal contempt of court charge. That is, she exploited her MP position to encourage others to also break the law by violating his injunction at a Kinder Morgan work site. Ms. May explains on her web-page the situation and events. I quote the details because they are consistent with what place-based people are confronting around the globe. Green Party of Canada Leader Elizabeth May talks of changing the world on YouTube. The day following my talk extreme weather events struck hard. Six tornadoes tore through the Ottawa area and western Quebec. Three of these tornadoes caused extensive damage in the Ottawa area, with the first tornado touching down in Calabogie, the second in Dunrobin prior to skipping across the Ottawa River to Gatineau, Quebec, and the third touching down in west Ottawa. Tornadoes four, five and six hit Val-des-bois, Otter Lake and the Baskatong reservoir, all in western Quebec. Approximately 60 buildings were damaged in Dunrobin, 215 in Gatineau, Quebec, and 100 in west Ottawa. Also of note are the 25 homes that were damaged in Pontiac, Quebec, north of Gatineau, due to very strong winds. Sixteen telephone poles in a row were ripped out, and nearly 450,000 properties suffered blackouts, some for up to approximately five days. One man was killed in eastern Ontario and ten people were reported injured. Unfortunately, the Scientists’ Warning of more extreme weather events is happening in Ontario and Quebec. I’m off to Europe where I will stay into December to attend the Katowice Climate Change Conference that includes the 24th session of the Conference of the Parties (COP 24). Finally, I invite you to help us advance our work by taking two actions. First, we’d like to know more about you and all the individuals endorsing Scientists’ Warning. Please take a look at our short survey. It should only take three minutes to fill out, and we’d really appreciate hearing from you. Second, we are building a network and spreading the word on challenges and opportunities to make a difference in troubling times. Please tell others about Scientists’ Warning and invite them to join with us in worthy endeavors. Please endorse the warning and take action with us.